Victiv Daily Fantasy Baseball Games - Pinch Hitter Used! NEW Daily Fantasy Baseball Games Offered at Victiv! VICTIV has just announced their new and unique daily fantasy baseball games! We love their rules and roster formats! Check this out! Victiv prides themselves on developing roster flexibility and a scoring format that most closely reflects the performance of each sport's respective athletes. As such, they have created their baseball games with a format that is unlike any other daily fantasy sports site on the web. Pitching Staffs, instead of one or two pitchers will be used and the total staff's score will count. There is a "pinch hitter" and this means that only your top 7 of your 8 hitter's scores will count! That means if one hitter is a bust, you can still have a killer lineup. Positional flexibility is apparent with one Pitching Staff, 3 outfielders, 4 infielders and one Pinch Hitter (any non-pitcher). Finally, performance-based scoring is used which will be based on the real-world value of each play as determined by the run-expectancy matrix. The run expectancy matrix is a sabermetric graph that scores each batter's at bat differently, based on the game situation! Victiv calls their scoring format "performance scoring" as opposed to basic scoring and bonus scoring. Victiv decided not to use a Win as a scoring stat because it is relatively random, as a pitcher who does not make it through 5 IP cannot earn a win, yet a pitcher who gets rocked but has run support does earn a win. So Victiv set up a pitching staff system without the Win bonus, a pure scoring system, which allows owners to draft a pitching staff that earns stats for the starter and the bullpen. Winning teams will be those on which the starter-bullpen combination pitched the best possible game, and fantasy points will reflect that performance. Best of all, every pitch in the game will matter. As previously mentioned, you choose a pinch hitter whose stats are used if he performs better than one of your starters. In other words you choose 8 hitters and the 7 best hitters' stats are used. This is brilliant because baseball is a game of variance. Hitters have an on base percentage of about .320 on average. This equates to a whopping 21.4% chance that a hitter goes 0-for-4 and gives you zero points. Without a pinch hitter, an 8 man roster then has a crazy 85% chance that at least one player scores 0 points for you. When you add a pinch hitter, that probability decreases dramatically to 55%. Victiv argues that having 4 outfielders and 3 infielders is a better way to play. "This setup offers a large degree of flexibility, increasing the fun and challenge of roster construction, without the undue burden of selecting to fill fielding positions that are largely irrelevant to fantasy performance." Every instance of a baseball game, shown above, has an expected runs scored for that inning. Starting from scratch, 0 outs and no runners on, a team can be expected to score .4552 runs that inning. To find the value of a hit, you are looking at the difference between two run expectancy states. In other words, if you hit a double as the first batter in the inning, you go from 0 outs, 0 runners on to 0 outs and a runner on 2nd. The value of that double is the increase in expected runs, which is 1.0393 minus .4552 which equals .5841 expected runs added by hitting that double. Without getting too complex, Victiv takes each batted ball and event and applies it to the run expectancy matrix for both hitters and pitchers and by averaging out all of the possible scenarios for each occurrence (single, double, strikeout, etc. ), they found the optimal performance scoring system in daily fantasy baseball. We love this new baseball format and so should you. It is new, fresh, and intuitive! It is the road less taken, yet a road that makes more sense. 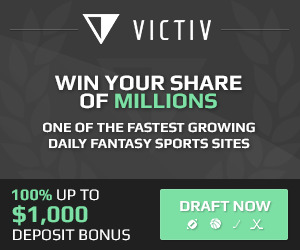 Victiv is poised to be a force in the daily fantasy sports landscape, and we highly recommend that you add them to your DFS arsenal and also so you can take advantage of the best bonus possible, which is 100% up to $1000 in free cash! Sign up now at Victiv!